Aussie golfers Wade Ormsby and Richard Green have good reason to be right on the front-running pace at this week’s KLM Open at Zandvoort. Ormsby added a second round two under par 68 to his opening 61 to slip back to a share of second place behind Dane Soren Kjeldsen on a day of ‘preferred lies’ on the Kennemer Golf Club course. Kjeldsen continues to display the form that earned the 40-year old success earlier this year in the Irish Open in posting a second straight score of 64 to move to the top of the board at 12-under par. Ormsby, who was two under par through seven holes, then posted 11 straight pars to be tied in second place with England’s David Horsey. Fellow Englishman James Morrison, married to Australian-born Jessica, carded a 67 to be also well-placed heading to the weekend rounds at 10-under par. Green, who matched Kjeldsen’s 64, is among seven players locked in fifth place at nine under par and only three from the front. Race-car loving Ormsby and Green are no strangers to the Dutch North Sea coastline course as it is laid out adjacent to the Zandvoort race track circuit that played host to the Dutch F1 Grand Prix from 1958 to 1985. The Aussie pair have spent many hours over many years while contesting the KLM Open inspecting the circuit and at times have been fortunate to lap the circuit when various race teams have been at the circuit practicing. 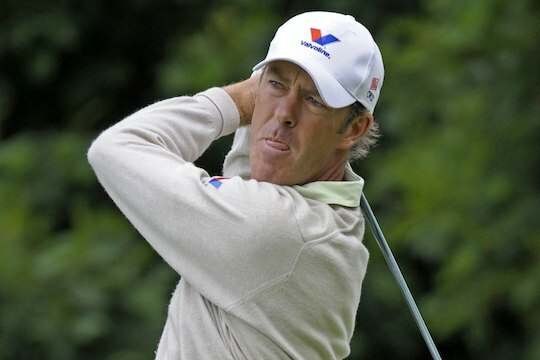 Now Ormsby and Green find themselves on the other side of the safety fence and high on the weekend grid for the KLM Open, and also looking to become the first Australian-born winner of the event since Perth’s Stephen Leaney captured the 2002 TNT Open and two years after winning in 2000. And in-form Daniel Gaunt, competing in the last group of the day, kept his good form going in holing a seven-foot birdie putt in superb bogey-free 67 and make the cut right on the three under par mark. Gaunt had birdied the sixth and seventh holes and like Ormsby looked set to then post 11 closing pars. “We were in the rough off the tee down the last but Daniel played this superb second shot to seven feet and knocked it in,” said his England-born caddy John ‘Ronnie’ Roberts. Indeed, Gaunt is currently lying 104th on the Race to Dubai and inside the top-115 who will earn automatic 2016 European Tour membership. Also at three under par is Queensland’s big-hitting Scott Hend (72) while Mandurah’s Jason Scrivener added a 67 to his opening 68 as he looks to build on last week’s T14th in the M2M Russian Open. And legendary Tom Watson celebrated his 65th birthday that was on September 4th in making the KLM Open cut with rounds of 69 and 68.